Metaphors are a powerful figure of speech, and are quite common in the English language. Metaphors are quite useful in astronomy, because of their ability to link abstract or difficult astronomical discoveries and theories to everyday occurrences that most people can understand. I use metaphors and analogies quite a lot, as anyone who has read many of my postings knows. So, in general, I have no problem with the use of metaphoric imagery in the dissemination of astronomical news. Holy Grail: When an important discovery is made (or is thought to have been made), it will often be called a "Holy Grail." Various Holy Grails have been found or searched for over the years, including the Cosmic Microwave Background, variations in the Cosmic Microwave Background, extrasolar planets, smaller extrasolar planets, pictures of extrasolar planets, etc. An irreverent discussion of Holy Grails in astronomy can be found here. Nonetheless, the "real" Holy Grail is a mythical object that nonetheless has been hunted relentlessly by many people for millennia, to no avail (claims by by Henry Jones, Jr., notwithstanding). So, properly, an astronomical Holy Grail would be a discovery that (a) will never happen, because it is mythical, and (b) will nonetheless consume many people's careers. Frankly, I don't want any of my research to fall into that category. 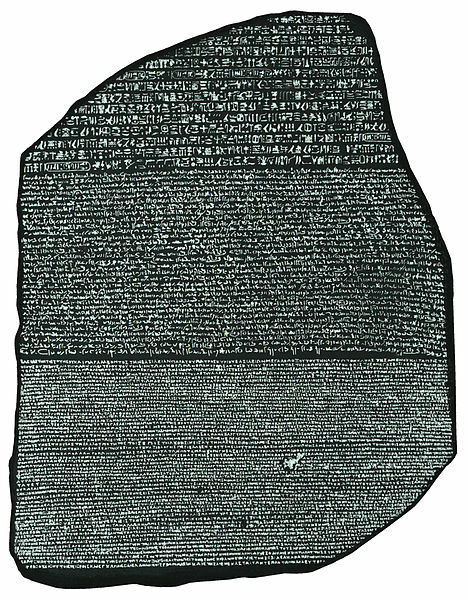 Rosetta Stone: The real Rosetta Stone is a portion of a priestly decree written in three languages: Egyptian hieroglyphics, Demotic (another Egyptian language), and Ancient Greek. Since the same thing is written three times, this stone permitted the translation of ancient Egyptian hieroglyphics. So, metaphorically, any discovery that allows us to understand an otherwise completely mysterious thing could be called a "Rosetta Stone." But all too often it is used to describe discoveries that are just another piece of the puzzle (to use another metaphor). An example: For three decades, the causes of gamma ray bursts were unknown, though many theories existed. In 1998, a supernova in a nearby galaxy coincided with a gamma ray burst in the same direction. This was truly a Rosetta Stone that allowed us to finally understand many of the gamma ray bursts. Five years later, another gamma ray burst was anointed the "Rosetta Stone" for the same finding. Granted, the later burst was very important for further confirming the hypothesis of the connection between gamma ray bursts and the deaths of massive stars, and it was an important finding. But I'd hesitate to call it the Rosetta Stone. I've also seen "Rosetta Stone" used to describe events that could also be (inappropriately) described as "Holy Grails," astronomical discoveries of important and rare objects. Just because something is rare or new or involved a lot of luck doesn't mean it is a Rosetta Stone or a Holy Grail! Smoking Gun: The term "smoking gun" is used to refer to a piece of evidence that is the conclusive proof of something. For example, the Smoking Gun Tape was a recording of Richard Nixon that proved that he was trying to cover up the Watergate scandal illegally. In astronomy, "smoking gun" often refers to discoveries that hint (or even strongly hint) at proof of a theory, but often these findings are still controversial. Just Google dark matter smoking gun and you'll get a list of lots of discoveries that were all claimed to be the smoking gun of dark matter. I am pretty sure that dark matter exists. There's a ton of evidence for it. But none of those individual pieces of evidence is a "smoking gun." If the existence of dark matter were put up to a criminal trial, it would be a case relying on many pieces of strong circumstantial evidence, and the DA would get a conviction from an astronomical jury. But the true "smoking gun" for dark matter will be laboratory detection of dark matter particles. Only then will there be no room for doubt about its existence. In short, I would claim that at least 75% of astronomy articles claiming to have found either a "Holy Grail," "Rosetta Stone," or "Smoking Gun" have really found no such thing. So, if you are an astronomer, please don't use these terms unless you are certain that you're using the metaphor properly! If you ever see me using one of these terms from now on, please stop by my office and beat me silly with a copy of Strunk and White. And, if you are reading an article and come across one of these terms, just mentally replace it with "really neat discovery." Most of the time, you won't be losing any real meaning. Haha! Duly noted. I have used them myself, but only while wincing at my own inability to convey the importance of a discovery in other terms.